Getting some sunshine much more quickly than I thought likely, as per 9:45 am MST visible image (top). Zoomed to eastern Pima County below. Conditions at the airport are very similar to what they were 24-hours ago, but with SLP up by almost a mb. There was enough heating yesterday for thunderstorms to move into the metro area at sunset last evening, as per above webcam view. The plot of detected CG flashes below (from Atmo and Vaisala for 24-hours through 5:00 am MST this morning) shows most activity in eastern Pima and northwestern Cochise Counties. Although winds gusted 35 to 45 mph rain amounts were fairly light in comparison to Friday's big event. There seem to have been serious problems with the ALERT network data and a large number of sites are missing this morning. Observations indicate a Trace at the airport, 0.06" here and at DM AFB, with Nogales picking up half an inch. The sounding plot for TWC (above from SPC for 12 UTC) is VERY moist and quite unstable in low-levels. However, there are some downsides. The very moist low-levels are currently capped by a mesoscale subsidence layer (onion sounding aloft) left behind by the MCS of last evening. The spatial extent of this layer with considerable CIN is, of course, unknown. The winds aloft are light and variable below 250 mb - so storm movement may be slow and erratic - resulting in heavy rain and wet microburst threats. The surface layer requires considerable heating to, and/or mesoscale outflows, to overcome the capping. This could be a problem, given the widespread cloudiness over southeastern Arizona and all of northwestern Mexico (associated with a large, subtropical inverted trough at 500 mb). My subjective appraisal, based on the morning observations, is that heating will be considerably restricted, so that propagation of storms into desert elevations would be dependent upon mesoscale outflows. However, the forecasts from the 06 UTC runs of both versions of the WRF model are more optimistic - both versions forecast a very active afternoon here in eastern Pima County. The forecast below is of solar IR in W/m2 valid at 1:00 pm this afternoon from the WRF-GFS. The model keeps heavier cloud and early storms off to south and southeast and has strong heating for the metro area. It appears that a 1:00 pm special sounding could be very useful today, if the situation remains murky at midday. The model forecast sounding for TWC valid at 3:00 pm MST (above) is very unstable, with CIN layer gone, and would support heavy storms, as per noted above, for the metro area. The WRF-GFS forecast of accumulated rainfall through midnight tonight is below - definitely a big day in the model forecast. Close metwatch needed today. Katie and I are going out to take a course on making special pamphlets at Panther Peak Bindery this morning - so not much blogging time. Radar image above was from 8:12 pm last evening. We had severe gusts of about 60 mph a bit earlier and I saw new tree limbs down on my walk this morning. IR satellite images below are from last evening top and bottom for 5:30 am MST this morning. The combined outflow from the two large MCS systems has raced westward all the way across the Mojave in California - very impressive. The SPC issued watch number 424 for Arizona yesterday afternoon (above) and got most of the reports, although activity developed considerably east of where the 06 UTC WRF forecasts indicated yesterday. With more than 25 reports, this may have been a rare, Arizona "moderate" outbreak. Lots of photos online - Mike Olbinski reports yesterday as one of his best three in Arizona. He also reported heading far west on I-8 but that he was unable to keep ahead of the outflows and nasty haboob. As for precipitation, the 12-hours ending at 5:00 am produced nearly complete coverage across the ALERT network (100% for the high-elevation zone and 95% for the low-elevation/metro zone). There were 32 reports of more than half an inch and 8 sites had more than an inch. The Catalinas sector is shown below. Here at house there was 0.62" in gauge this morning. The past seven days have illustrated how difficult forecasting POPs is here in Arizona - most 12-hour periods had zero coverage while at least 2 had 100% - verification works out only when averaged for climatological periods. Edited to add: Estimated G 60 mph here with considerable dust at 5:50 pm MST! Drier air has so far invaded only into far eastern Cochise County and the 2248 UTC (3:48 pm MST) visible satellite image above shows a number of thunderstorms north - east - southwest of metro Tucson. The thunderstorm north of Benson clearly appears to be severe with very high reflectivity. Below is a cross-section through this storm indicating some reflectivities above 70 dBZ and tops to 50 kft above the radar elevation. No warning at 4:00 pm but storm appears to be in the San Pedro ag area where there are many farms. 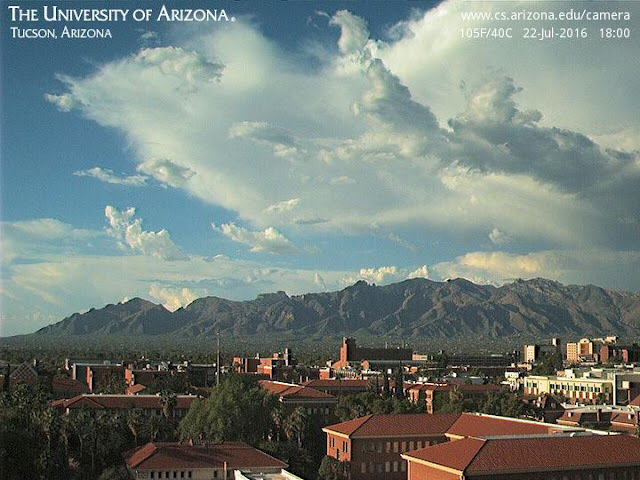 Big Storm Day - Will It Just Miss Tucson? Beautiful sunrise this morning behind Thimble Rock, after a very suppressed, as expected, day yesterday. The plot below shows detected CG flashes though 7:00 am MST this morning, with southern Arizona almost totally devoid of thunderstorm activity. The morning soundings at TWC (above) and also PHX are quite unstable. Here at TWC there is a moist surface layer up to about 800 mb, but with an elevated mixed layer (EML - an old boundary layer - BL) from higher terrain above. The EML essentially caps the surface based BL for much of the afternoon, allowing it to really heat up in the deserts. But, when heating and convergence acts to merge the two layers into a single BL late in the day, serious storms are likely. There is some drier air (light blues) to the east, northeast, and southeast - below is blended PW analysis for 12 UTC from CIRA at Colorado State. This drier air is the wild card for Tucson, since storms will likely develop in the convergence zone between the dry and moist air masses. The 06 UTC WRF-GFS forecasts the dry air to be over the east metro by 5:00 pm (above). The NAM version forecast pre-sunrise storms over Tucson, and I didn't look at it in detail. The forecast surface plot for 7:00 pm below indicates dewpoints as low as 42F along I-10 east. There is some convergence over the City - but will it trigger storms here? The WRF-GFS forecast of composite radar echoes valid at the same time (bottom) develops the storms just west to northwest of the metro area - this is a scenario that we often experience here. So, a careful weather watch is the best approach for this afternoon. 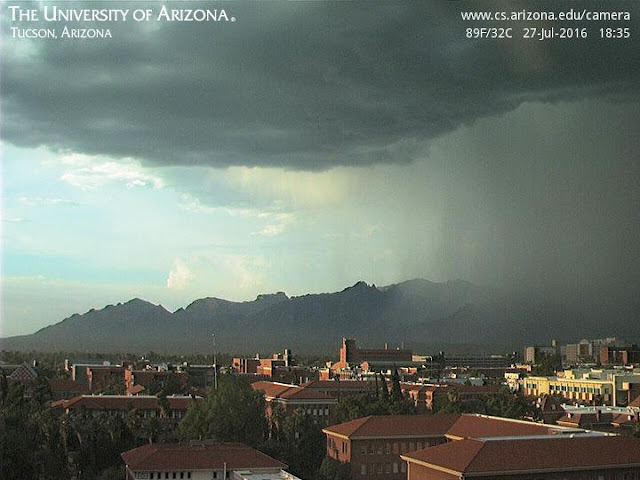 Severe, high-based thunderstorms moved into the metro area a bit after 6:00 pm MST yesterday evening. Above is view north from campus at 6:35 pm and below is an IR satellite image from 5:30 pm. There were nine reports of severe thunderstorm winds sent to SPC by the TUS NWS Office (above). The airport had gusts to only 51 mph; but DM AFB had gusts to 61 mph; and the Nogales airport recorded gusts to 71 mph. Here at the house we had several gusts around 60 mph between 7:00 pm and 7:30 pm. The plot below of detected CG flashes is for the 24-hours ending at 6:00 am MST this morning - certainly an active storm day for southeast Arizona. As for rainfall - the airport had 0.53", DM had 0.76" and Nogales had 2.01". Here at the house we had another 0.12" before midnight (total for yesterday (0.33") and then storms during the early morning hours added 0.41" - quite a nice total for last 60 hours (0.97"). Across the ALERT network only 9 sites had rainfall during the day (05:00 am through 05:00 pm), but 100% of the sites had measurable rain during the night (05:00 pm through 05:00 am this morning). 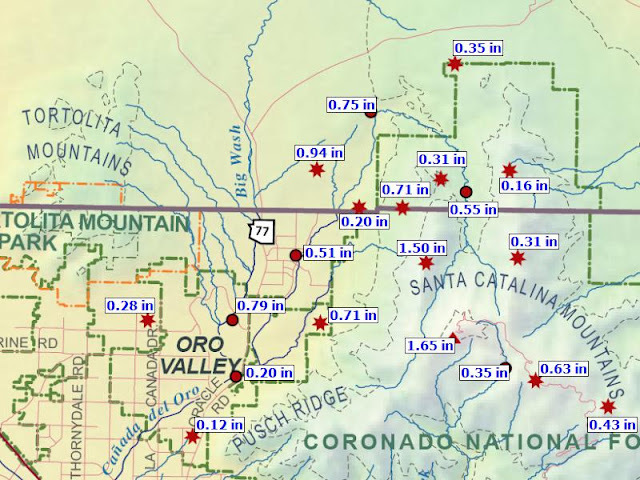 There were 31 ALERT sites with more than half an inch and 5 with over an inch (these were in and near the Catalinas). The morning sounding at TWC was taken with thunderstorms nearby and during light rain - thus, a highly modified sounding. However, the widespread rains have left southeastern Arizona much cooler this morning. Very hard for atmosphere to recover after such an event. Storms moved into the eastern part of the metro area late in the afternoon yesterday - above is composite radar chart for 5:45 pm MST. Strong storms moved through with gusty winds around 8;30 to 10:00 pm. Here at house we had 0.23" during the night and another 0.16" from a small shower around 7:30 am. Plot below shows detected CGs for 24-hours ending at 2:00 am this morning, with a definite increase in storm activity over Pima County. The ALERT network rainfall data indicate only 4 sites with rainfall from 5:00 am to 5:00 pm yesterday, but then from 5:00 pm through 5:00 am this morning 75% of the sites recorded 0.04" or more. Heaviest amounts were in the Redington Pass area. Sites with no precipitation were in the western portions of the network. The TWC sounding is pretty chopped up this morning and anticipating what it will look like late afternoon is a challenge. The 500 anticyclone has shifted into the center of the Great Basin, so steering flow will be generally north to northeast. 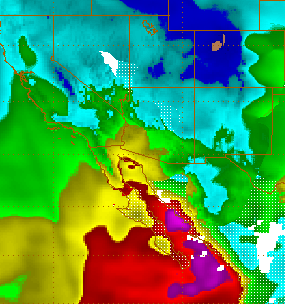 This is a pretty good situation for southern Arizona, as long as the low-level moisture and CAPE persist. I have to be away this morning and so will just have a cursory post. 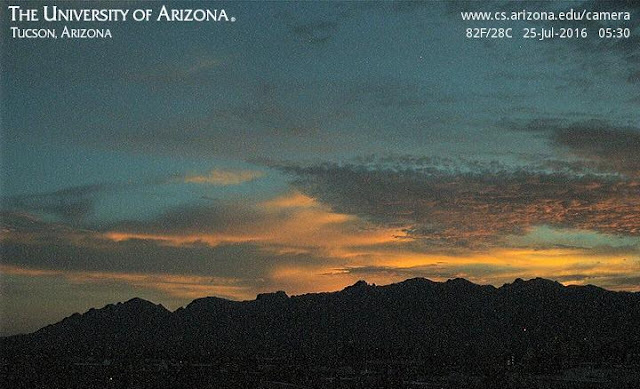 Very nice sunrise today - above looking north from campus and below looking east-northeast from house. Another very down day for eastern Pima County - only 2 sites had rainfall across the ALERT network - 0.51" at Arivaca and .041" at another site. Complex day today with much debris cloud and more outflows during night. The KEMX NWS radar has been down several days and that complicates things also. The 06 UTC forecasts from the WRF models at Atmo both forecast significant thunderstorms for eastern Pima County later today. However, neither run from 00 UTC forecast much in the metro area, so we'll see what the 12 UTC runs forecast. I have been out cleaning up tree and limb damage from the microburst event of four weeks ago and will just take quick look at the weather setting this morning. Yesterday was another completely down day over most of southern Arizona, except for along the Borderlands and a storm in northeastern Cochise County. The 12 UTC WRF runs seemed better than those from 06 UTC. The plot of detected CGs below is from Atmo and Vaisala for 24-hours ending at 6:30 am MST this morning. There was no rainfall recorded across the entire ALERT network yesterday. Our really bad July continues. There was significant thunderstorm activity in northern Sonora and IR image above was from 05:30 am. The storms have sent several moist outflows into southern Arizona. The current Doppler velocity image below is from Yuma at 1.8 degree tilt and indicates a fairly deep outflow with wind speeds of around 30 kt. During past few hours winds at Yuma have been from the south-southeast with gusts as high as 43 mph. Dewpoints there are running in the low 70s. The morning TWC skewT plot above continues with about 1.5 inches of PW. The layer below 700 mb has considerable CAPE, but now has a capping, old elevated boundary above. So CAPE and CIN are doing battle again today. 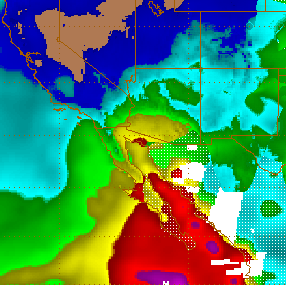 The 500 mb pattern is very chopped up and winds aloft are light and variable below 300 mb - not good, TS Frank has helped push high moisture into southern Arizona (below is CIRA blended PW analysis for 6:00 am) and values of PW are 1.5 inches and higher over a large portion of the area from Tucson west. However, other features just are not coming together well. Even though there is a weak inverted trough at 500 mb to our east, models continue to keep storm activity today along the Borderlands and into central Pima County - areas with higher elevations than the metro region. What steering flow there is would try to move storms from the Catalinas toward the metro - so that's a bit of a positive. Back to the yard mess. Yesterday was the most suppressed day of the past few and was characterized locally by many orphan anvils with no associated precipitation by the time they were overhead. View above is from 6:00 pm MST last evening. The CG flash density plot below (from weather.graphics and Vaisala) shows the dearth of thunderstorms over most of southern half of Arizona yesterday and last night. There was essentially zero percent coverage of rainfall at the ALERT sites during past 24-hours, as only 1 of 93 sites measured rainfall of 0.04". However, the situation appears to be improving today. TS Frank is apparently going to pass close enough to southern end of Baja to push a surge of higher moisture into the Southwest - particularly tomorrow and Monday. The above graphic shows MIMIC PW analysis from Univ. of Wisconsin CIMSS for 6:00 am this morning. High values of PW are already into parts of Arizona, even though Frank is currently just south of 20 degrees north at 110 degrees west. The morning sounding from NWS TWC on campus (below from NCAR RAP/RAL) has 39 mm of PW - up from yesterday's brief dry down. The steering winds are very good for organized storm events, as they would move storms toward the west-northwest, leaving the anvils trailing behind. Low-level moisture should continue increasing some during the day. If the boundary layer mixes out to a bit above 700 mb, I estimate CAPE at about 1000 J/kg, but with a layer of CIN requiring outflow help to get storms into lower elevations. The WRF-GFS forecast from 06 UTC last night forecasts a large area of storms into the metro area around 8:00 pm (above). The GFS version did well picking up the nocturnal storms and near-severe outflow on Thursday night, so I'm showing that version here. The timing Thursday was too fast in the model forecast by 3 hours or so. The NAM version also forecasts nocturnal storms, but later than the GFS version and has them dissipate near the Pima/Cochise County line. The GFS versions 10-m wind forecast, below also valid at 8:00 pm, indicates the possibility of a very strong outflow impacting the metro area after dark. Currently, the NWS forecast for TUS indicates a sunny, hot day followed by a 10% chance of thunderstorms after 5:00 pm through 5:00 am tomorrow. The forecast after that is for a 30% chance of rain at the airport every 12-hour period through the next six days. Seems like folks there couldn't decide which of the coming days will have a better chance of storms, thus the climatological type homogeneous forecast. There was a major wind event at our house I Oro Valley around 3 to 3:30 am this morning. The house was shaking and wind was whistling around the edges – sounded like Boulder! No lightning or rain. The airport had gusts to 47 mph a little earlier, and D-M reached 38 mph. There was a power outage here at Vaisala around 1:30 am. Basically, I found that all of the observing stations from FHU to Nogales to Sells to PHX to Muleshoe Ranch back to FHU had early morning gusts of 30 mph or more from the long-lived outflow. 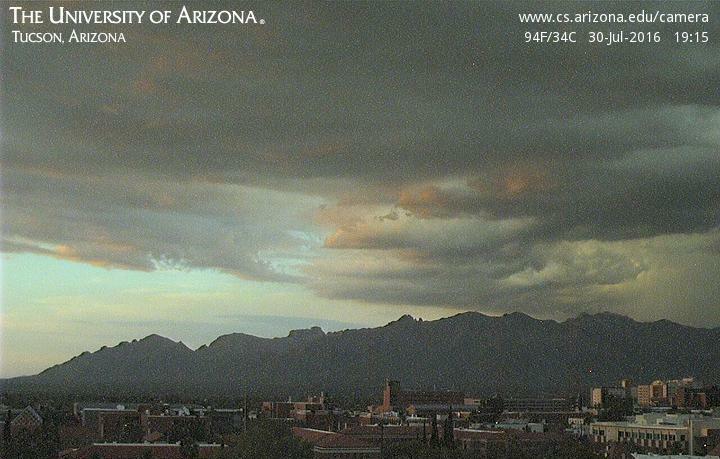 It developed as storms moved from Mexico into southwest Cochise County around midnight and passed Sky Harbor at 4:40 am MST, with the visibility reduced to 3 miles in dust. The only sites within the large area outlined that did not gust to 30 mph or greater were Sollers and Rincon RAWS sites at high elevations. 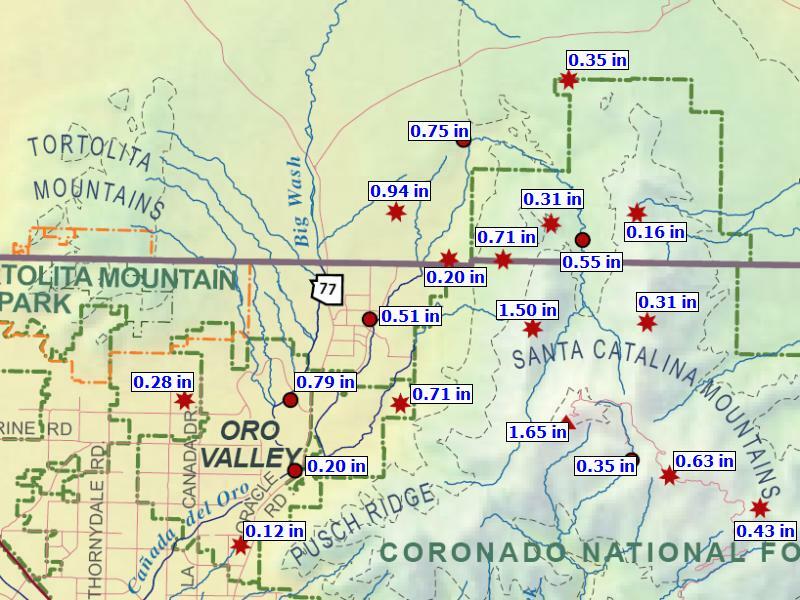 I could find no really strong, Boulder-like winds in the MesoWest data in Oro Valley, but these sites are further west than Ron, who is nearer the west end of the Catalinas, where there may have been some orographic enhancements. I also took a look at the 00 UTC runs of the WRF models and found that, while there was nothing forecast by the NAM version, the GFS version did forecast a large, nighttime outflow. The WRF-GFS radar forecast above was valid at 10:00 pm MST last night and the 10-m wind forecast below was valid at 11:00 pm. The location of the outflow event was very good, although the actual event occurred 2 to 4 hours later than forecast. Over past decades meteorologists have tended to use certain colors of contours and shading to denote the character of the fields shown. For example, moisture/precipitation fields have usually been depicted using greens for higher values and browns for lower. Temperatures have been shown in blues (cool colors for colder conditions) and reds (warmer colors for hotter conditions). For example, the standard depiction of cold fronts in blue and warm fronts in red. However, with the huge proliferation of graphics during recent years, these old approaches seem to be slip sliding away. 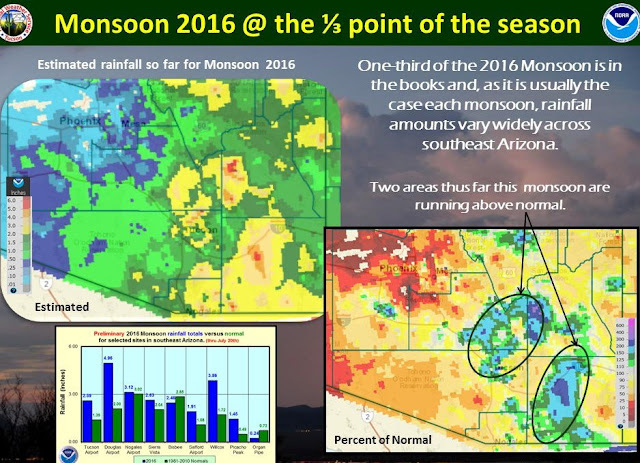 Graphics above are from the Tucson NWS webpage and relate to precipitation during the first third of the NWS defined monsoon calendar period from June 15 through September 30th. Upper left shows estimated rainfall for the period (June 15 through July 20) - source is unknown, but may be some combination of gauge observations and radar estimates. There is some green but low amounts are in cool colors. At lower right is percent of normal with the color scale completely reversed relative to upper left; a great way to cause some confusion. Graphic below is also percent of normal, but for July 13 through 19. This plot uses more typical colors for dry and moist areas, and is from NWS Climate Prediction Center. The useful legend at bottom provides some quantitative information about what has been plotted and gridded. The week shown was certainly a grim one for the Southwest and most of northern Mexico. Considerably more thunderstorm activity yesterday, as per detected CGs above from Atmo and Vaisala. Storms stayed mostly to higher elevations and avoided the metro area, except for one afternoon storm out to the west. Once again less than 20% of the ALERT sites measured rainfall, with amounts light except for 0.67" at Manning Camp in the Rincons. Time-series of GPS PW from Atmo above, show values decreasing this morning over southeastern Arizona, which may reduce CAPE some for the afternoon. The WRF-NAM forecasts storms again sticking to higher elevations (forecast of composite radar echoes below is valid at 6:00 pm MST this evening). Two new TSs this morning - NHC named the one closer to Mexico first, so the storm of interest for us is Frank (above). 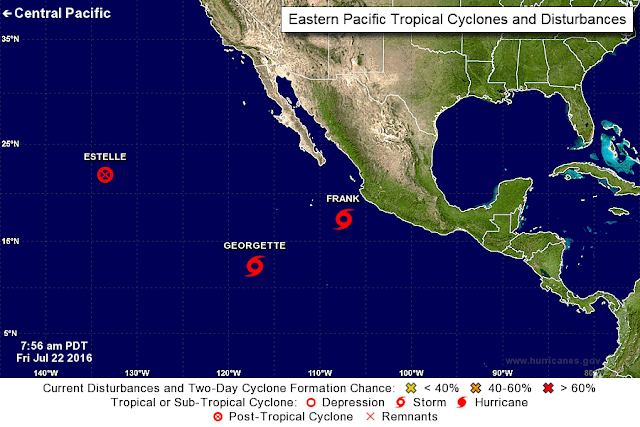 The morning NHC forecast for Frank is shown below. The forecast track is marginal for the storm to generate a strong GoC moisture surge and models seem to be trending further west with Frank's forecasts. So, it will be something to watch, but a more easterly track would definitely be more interesting. What's Going On With TUS ASOS?